The CV Series' chrome grille resembles those on heavier International trucks and sets it apart from Chevrolet versions. Navistar officially returned to the Class 4 and 5 truck segment with its International CV Series. It will be aimed primarily at small business owners who value dealer service as much as truck products, said Michael Cancelliere, Navistar’s truck and parts president. CV, for Commercial Vehicle, includes a 6.6-liter, 350-horsepower V-8 diesel with 700 lb.-ft. of torque. Equipped with that engine and Allison 1000 or 2000-series automatic transmissions, the CV has gross vehicle weight ratings of about 16,000 to 23,500 pounds for 4x2s and up to 23,000 for 4x4s. Gross combination weight rating is 37,500 pounds. The CV Series will be offered with two-door regular or four-door crew cabs. It includes a commercial-style forward-tilting hood, which provides easy access to the engine and to routine maintenance points. 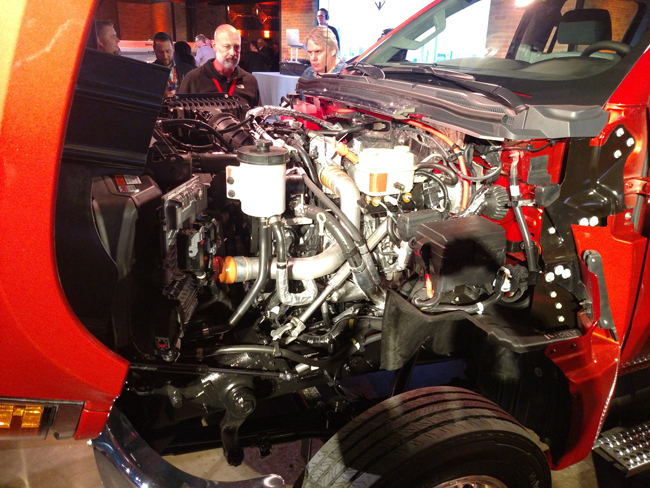 Ford, whose F-450 and F-550 trucks dominate the market, use a stationary front end with an automotive-style alligator hood that limits access to engines and accessories, Cancelliere said. So does Fiat Chryler’s Ram, which has made inroads in this end of the medium-duty market in recent years. The International CV offers automotive-like comfort, featuring premium interior finishes and outstanding driver ergonomics. Multiple infotainment options are available, including an 8-inch color touch screen with navigation and, for the first time in an International truck, Apple CarPlay and Android Auto. Tilting hood allows easy access to the GM-built V-8 diesel and its accessories. An advantage for customers, according to Cancelliere, is that International dealers sell and service only commercial trucks, so they understand what commercial users require in product and service. International dealers in the U.S. and Canada operate more than 700 locations with 9,500 ASE-certified technicians familiar with diesel engines and associated drivetrain equipment, he said. Service is also backed by an extensive parts network where 98 percent of parts are available through either dealer inventory or International’s network of parts distribution centers. Dealer sales people specialize in commercial transportation sales and spec’ing, making it easy for a customer to pick the configuration and specifications that are right for any vocational application, he said. In addition, International’s Application Engineering Team offers access to vocational engineering experts who can help customers design a custom configuration geared to each application. CV was co-developed with General Motors, and Chevrolet will sell Silverado 4500HD and 5500HD versions that closely resemble International’s; GM will also sell a 6500HD Class 6 model. These also mark GM’s return to the Class 4 and 5 market that it abandoned in 2009. International left that segment in 2015 when it dropped the Class 5 TerraStar, along with its own 6.7-liter V-8 diesel. In the joint venture, GM supplies the 6.6-liter Duramax diesel, and cabs and interior trim based on lighter-duty Silverado pickups and cab-chassis models. Navistar supplies the chassis, and will build both product series at its plant in Springfield, Ohio. Production has begun, said Chad Semler, director of medium-duty product marketing, and CVs should be at International Truck dealers in January. “We’ve designed, built and tested the CV Series to deliver the commercial-grade power, reliability and practicality that growing businesses require, along with the comfort, safety features and easy drivability that drivers appreciate,” Cancelliere said. It was tested in the extreme cold of Alaska, broiling heat of Arizona, and at 12,000-foot altitudes in Colorado. The CV Series features include a gear-driven transfer case for 4x4 versions; a high-strength, low-alloy steel frame rail; and a painted chassis for enhanced longevity and corrosion resistance, said David Majors, Navistar vice president for product development. Ease of upfitting is accomplished with straight frame rails with no rivets on the top flange, providing a clean cab-to-axle area, making it easy to mount bodies for virtually any application. Like other International trucks, the CV uses HuckBolt chassis fasteners that provide consistently superior clamping force without re-torqueing and won’t come loose even in extreme environments, Majors said. CV offers a dual battery box mounted under the cab, with options for additional frame-mounted batteries. There are also multiple options for fuel tanks, exhaust outlets, wheelbases and other equipment to suit various bodies and applications, he said. CV Series customers also have access to Truck Specialty Centers which are fully owned and operated by International Truck. Experts there provide quick, efficient and cost-effective custom engineering solutions.